Meatballs: We love ’em, but we’ve been eating them the same way our entire life (drenched in red sauce with a pound of spaghetti). There’s nothing wrong with that classic pairing, but there’s a whole universe of other possibilities just waiting to be devoured. Ready thy forks, knives and toothpicks. A fun twist on spaghetti and meatballs. 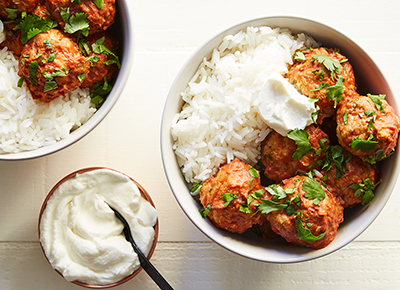 We love meatballs. We love chicken tikka masala. So we combined them into the greatest dish ever. We won't tell anyone you cheated with Italian sausage . They’ll last you the whole workweek. We can’t get enough of the rich and creamy sauce. You’d never guess these were made from tofu. Psst: It costs only $15 to whip up four whole servings. It’s impossible to have just one. We’re never going back to the frozen kind again.